Summer in Texas can leave you at a loss when it comes to meals. A steak can sound so appetizing but the sides are just too much. Who wants a hot potato when it’s 105 degrees outside? This is one of my favorite ways to make a salad a meal. Grilling lettuce is quite brilliant. The goal is to get a slight char on the outside leaves but the inside remains crisp and cool. Your lettuce will have more flavor than you ever thought possible… for lettuce anyway. Being that my favorite condiment is balsamic vinegar I usually drizzle mine with the good stuff… but a cold blue cheese dressing would be over the top. Preheat grill and set to medium flame. Season steak with salt, pepper or your favorite seasoning (I like Montreal steak seasoning) and grill to your desired doneness. Set aside to rest before slicing. While steak is resting, cut the romaine lettuce in half lengthwise and drizzle with olive oil, salt and pepper. Grill for a few minutes per side – just long enough to get some char on the outside leaves. 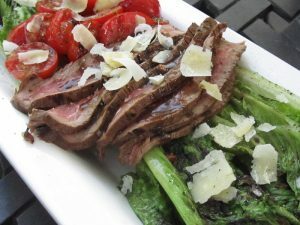 Arrange lettuce on a large platter and top with steak slices, tomatoes and shavings of parmesan cheese. Top with balsamic vinegar or your dressing of choice.